Kristen Hortenbach was teaching math to middle schoolers when her love affair with cooking and baking began to consume her life — and her substantial capacity for precision. Her blog, Picky Cook, has since garnered serious devotees, and her blood-orange cake has all but a cult following. "I had made a grapefruit yogurt cake that came out very well, and like most recipes that work well, I always want to use the same idea with slight variations," she says. 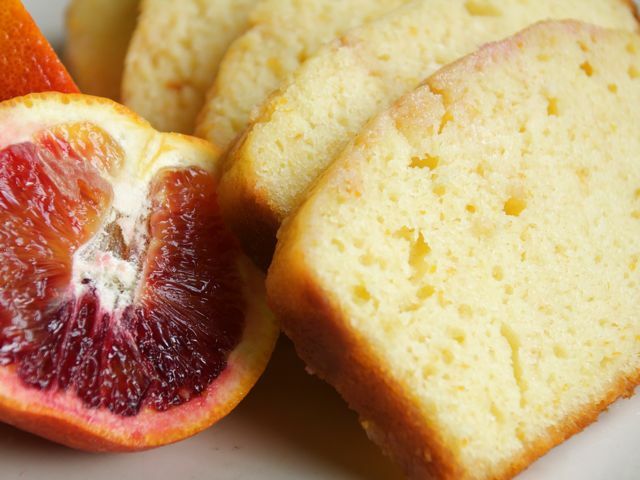 "I thought that the blood orange would taste amazing — and it's so stinkin' pretty that I can barely resist this variation, though grapefruit and lemon are delicious in this cake as well." Preheat the oven to 350 degrees. Grease an 8½-by-4¼-by-2½-inch glass loaf pan, and line the bottom with parchment paper. Grease and flour it and set aside. In another bowl, whisk together the yogurt, 1 cup sugar, the eggs, blood-orange zest, and vanilla. With a rubber spatula, fold in the dry ingredients a little at a time, stirring between each addition. Fold in the vegetable oil, making sure it's all incorporated. Pour the batter into the prepared pan. Bake for about 50 minutes, or until a cake tester placed in the center of the loaf comes out clean. Meanwhile, in a small pan over medium heat, cook ⅓ cup blood-orange juice and the remaining 1 tablespoon sugar until the sugar dissolves and the mixture is clear. Set aside. When the cake is done, allow it to cool in the pan for 10 minutes. Use a knife to loosen the edges and turn out into a rack. While the cake is still warm, pour the mixture over the cake and allow it to soak in. Let cool. To make the glaze, combine the blood-orange juice with the confectioner's sugar and use a spoon to drip the glaze over the cake.